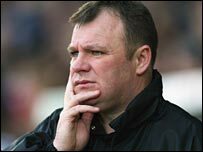 About the only thing Boston United boss Steve Evans does not have to worry about is picking his team. With only 11 senior players to select from for Saturday's vital game against fellow League Two strugglers Bury there are no decisions to be made. "Anyone is welcome to look at it. People reading from a distance might think we've actually got 14 or 15 players but the answer is 'no, we haven't'. With Paul Ellender suspended I have got 11 professionals," Evans told BBC Sport. "It's incredible. With a couple more injuries I will have to turn to the kids and try and get performances out of them. "But whoever wears the Boston shirt, if they keep the club in the Football League it will be a remarkable achievement." With Bury and Boston level on points just above the relegation zone, Saturday's game at York Street could hardly be bigger. Evans has no chance of keeping any tricks up his sleeve, though, with 17-year-old defender Jamie Stevens the only option to an 11 of Andy Marriott, Mark Greaves, Colin Cryan, David Gilbraith, David Farrell, Jamie Clarke, Stewart Talbot (who is an injury doubt), Ernie Cooksey, Drewe Broughton, Franny Green and Nathan Joynes. Boston's squad has steadily been reduced throughout the season with Evans forced to sell several of his top players to help ease a cash crisis which also means the club has no full-time physio and has travelled to some away games in cars. And with four players - Simon Rusk, Richie Ryan, Shane Nicholson and Stephen Vaughan - now out for the season through injury, Evans has finally lost the numbers game. "I was desperate to bring people in ahead of the deadline but because of the capping rule and the finances at the club in general the chairman did not sanction it," he said. "It is galling but I have to look at the 12 players I have got, who could be in danger of not getting paid. I have to look after them, so there are mixed emotions. But it is difficult." Most managers would regard that as a massive under-statement but Evans is well versed with financial difficulties at a club which is up for sale and reportedly facing eviction proceedings over non-payment of rent. "Our problems have been well documented all season and we have had to sell our best players," Evans added. "If you take the 12 we've got and add to it Julian Joachim, Anthony Elding, Tim Ryan, Lee Canoville, Andy Kirk, David Noble and Lee Beevers you start to say that's a championship squad. "But each month I have been ordered to sell players to raise money to help pay the wages. "Any manager would know it hurts you because we are all judged on results. That's hard, but the other thing I always have to have in mind is that I have to look after the players. "They are hard-working, honest players with mortgages, hp on their cars and children at school. "When I am sat in the boardroom discussing with the chairman why we should not sell and the chairman points out that people might not get paid I have to accept it and accept we are where we are." Even using youth-team players Evans was able to name only three substitutes for Boston's game at Wycombe last weekend. To make matters worse, he will also lose the services of on-loan Barnsley forward Nathan Joynes after the Easter holiday programme, which throws up the nightmare prospect of two games in three days. "I think I will be watching the game on the Saturday with my eyes shut, knowing I've got to get a team out to face Macclesfield on the Monday," said Evans, whose only dispensation for additional signings will come if goalkeeper Andy Marriott gets injured. Yet despite their apparent plight, the Pilgrims have taken seven points from their last three games to raise hopes of maintaining the League status they achieved by winning the Conference in 2002. According to Evans, the problems have helped galvanise a team scrapping for its life. "When the club informed me that no-one was coming in there was no point whingeing about it. We have to accept it and we work with what we have," he said. "We are getting the best out of what we have got and the lads are giving everything and more than you could ask. "Over the last month there has been a real togetherness to fight for this and the vocal support we have had in the last four or five games has been excellent. "And if we fight enough we have enough ability and commitment in the squad and tenacity in the squad and the staff to survive it. "In adversity you either become a hero or lay down and die. In the position we are in we have got to fight it out and if these players and staff keep Boston in the Football League it would be a miracle."